Acting without informing the U.S., Iraqi troops on Tuesday, July 28, seized control of a camp of Iranian exiles ferociously opposed to the regime in Tehran. It was the most significant operation undertaken by Baghdad since U.S. troops withdrew from the cities last month and is most likely a nod to Iran's ayatullahs, who brand the group as terrorists, as does the U.S. Yet in the convoluted politics of the region, the U.S., despite having tagged the organization on its terrorist list, had been a sort of guarantor of the safety of the Mujahedin-e-Khalq (MEK) because it was the enemy of its enemy Iran. The MEK, however, had become an embarrassing inconvenience to Baghdad's increasingly cozy ties to Tehran. Although Iraq has repeatedly said it is in its own national interest to remove the group, Iranian Supreme Leader Ayatullah Ali Khamenei, meeting with Iraqi President Jalal Talabani in late February, left little doubt as to what he expected the Iraqis to do. "We await the implementation of our agreement regarding the expulsion of the hypocrites," he was quoted as saying. On Tuesday, Baghdad obliged. Iraqi security forces wrenched control of the MEK base at Camp Ashraf from its leaders after they denied an Iraqi request to establish a police station inside the camp. 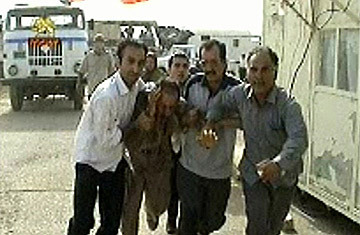 Clashes ensued that, according to the MEK, left six residents dead and some 400 wounded. (The casualties have not been independently verified.) Baghdad denies using lethal force. A video distributed by the MEK shows baton-wielding security forces beating unarmed protesters and using water cannons on a crowd, as well as several bloodied individuals. Clashes continued Wednesday, according to Shahriar Kia, an MEK spokesman contacted by phone. Iraqi security forces remain in the camp and "have surrounded all the places," he told TIME. Most of the camp's 3,400 residents have begun an open-ended hunger strike, Kia added, until Iraqi troops withdraw from Ashraf, U.S. troops assume control and the perpetrators of the attacks are tried and punished "in an international tribunal on the charges of crimes against humanity." Those are big things to ask for and unlikely to happen anytime soon, especially given that the U.S. military is looking to untangle itself from Iraq. Baghdad took over responsibility for Camp Ashraf, located some 40 miles north of the capital, from the U.S. military earlier this year as part of a wide-ranging bilateral security pact. Since then, Iraqi officials have ratcheted up the pressure, repeatedly warning that they would close the camp on the grounds that its residents were "terrorists" and "illegal aliens." Still, several deadlines came and went, and the stalemate ensued. The MEK  around 1,000 of whom hold non-Iranian travel documents issued by governments including those of the U.S., Canada, Australia and the European Union  called Baghdad's bluff, steadfastly refusing to leave. Iraqi troops, meanwhile, stayed on the outskirts of the 19-sq.-mi. camp (which the U.S. disarmed in 2003), maintaining a small but highly visible presence and venturing inside only with the consent or knowledge of the MEK.